A supernatural take on World War II featuring lush artwork by John Cassaday (superstar artist of ASTONISHING X-MEN & PLANETARY) in a deluxe hardcover format. While the outcome of War is in doubt, the Nazis frantically search for Ana, a girl with the ability to possess other bodies. This story is a thriller of the highest caliber: it can easily be a best-selling story in print or on film. We start with an occult murder in London and meet a special group of investigators, reunited with their leader Stanley who is back from a mental breakdown. From there we go to Romania and meet the resistance fighters and the Nazis who are controlling the region, including Ana. She is a girl from a small village with the ability to control other people and is definitely more than she appears. Possession is the theme and leads the British team to Romania and beyond in their pursuit of the truth, something no one on either side wants to know. It’s a real roller coaster ride and well-developed. The plot is solid and the story unfolds at a pace that keeps the reader moving, feeding the information at the right moments. There are some great twists and wrinkles but it doesn’t get mired in cliché. Dialogue is well thought and keeps the reader interested. There is genuine character development and the reader can’t help but develop a keen attachment to Stanley and his team. This is my first exposure to Fabien Nury but it’s a welcome introduction. Art is handled by John Cassaday with aplomb, pencils and inks. This is classic Cassaday art that really shines, right up there with Planetary in terms of detail and execution. At times the story becomes text heavy but panel layout and page flow don’t suffer. Publication and execution are excellent, although I found the stitched binding to be a bit loose. As always I wish they had dropped the dust jacket and printed on the hardcover itself. The format is odd: why such wide pages? Very few extras included; the original covers and a few additional panels. A foreword or afterword from the creators would have been appreciated. At $29.95 it’s a good value: easily two hours of solid entertainment with repeat readings recommended. 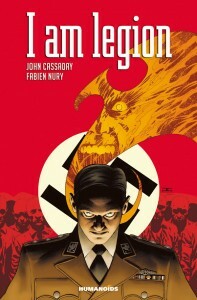 Minor quibbles aside I Am Legion is a must read for thriller fans.